For your peace of mind and safety | Tsukuba Dairy Products Co., Ltd.
As a socially responsible food manufacturer, we at Tsukuba Dairy Products have set forth quality and food safety policies and have also established and been operating a system that supports credible quality assurance activities in order to provide safe products that consumers can use with peace of mind. We comply with applicable statutory and regulatory requirements and strive to provide safe products that consumers can use with peace of mind. 1.We will always stay humble and think about things from the consumer’s point of view. We will provide a stable supply of high-quality, safe products with which consumers feel satisfied. 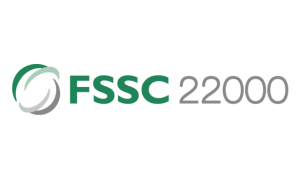 2.We will construct and maintain a food safety system based on requirements under FSSC22000 and continuously improve its effectiveness, products and operations. 3.We will comply with applicable statutory and regulatory requirements and company rules with a sense of ethics. 4.We will disseminate our food safety policy to all employees as well as reinforcing awareness of the importance of hygiene management and improving knowledge of food safety. 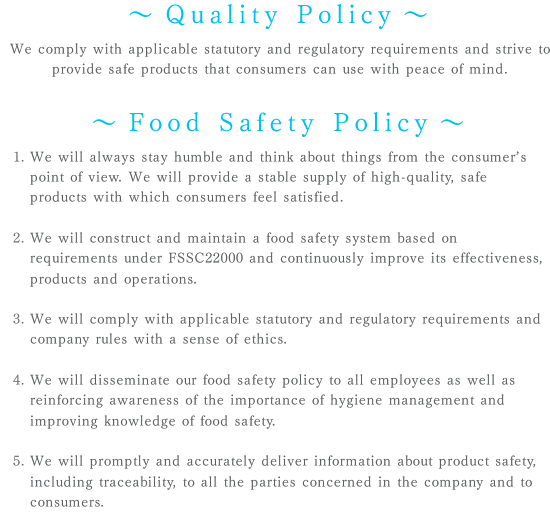 5.We will promptly and accurately deliver information about product safety, including traceability, to all the parties concerned in the company and to consumers. We at Tsukuba Dairy Products acquired ISO9001 certification for all lines to ensure quality at each stage of design and development, production and product sales. In addition to a system constructed and operated under ISO9001, in order to further reinforce the food safety we acquired ISO22000 and FSSC22000 certifications for our pasteurized milk line and LL line at our dairy product plant at the Tamari Plant. We will communicate with consumers and listen to their opinions and develop new products from the consumers’ point of view, and sincerely improve the production lines. We will unite and strive to provide safe products that consumers can use with peace of mind. We will develop products based on information acquired on consumers’ opinion and needs. We will design and develop products with quality and safety in mind from the product-design stage and strive for consumer satisfaction. It is essential to acquire safe and quality ingredients in order to deliver quality products to consumers. 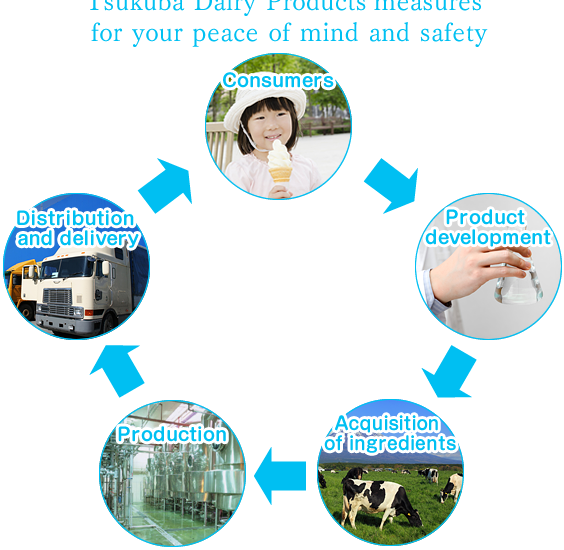 In regard to the selection of ingredients and packaging materials used at Tsukuba Dairy Products, selection and management of the suppliers are strictly evaluated and only supplies that meet the strict standards are used for our products. Furthermore, ingredients and packaging materials that are delivered to our company go through our own testing based on individual usage criteria to pursue a higher sense of safety. We at Tsukuba Dairy Products have acquired ISO9001 certifications on all product lines. We have set up checkpoints at each step of the production process from ingredients to production, and under the concept of the “next step is consumers,” we commit ourselves to the safe production of products through system management that only releases products that have passed the standards at each step into the next step. * TPM activity…A company-wide plant management method for production plants that aims to prevent loss occurrence that inhibits production effectiveness and revamp the employees, plant and company. We use a system to consistently manage order receipt, production and delivery in order to provide products that meet consumers’ demand. We also manage information on provided product ingredients, product production processes, test results, distribution channels and delivery destination records. We make efforts for risk management so that we can track back a product (traceability) and so we can promptly address an issue in case of emergency. 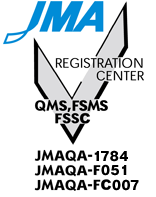 We strive for quality assurance regarding radioactive substances caused by the Great East Japan Earthquake. 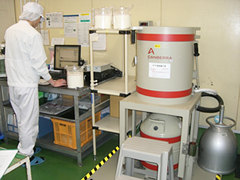 In order to deliver products to consumers with peace of mind and a sense of safety, we ensure the radiation level in raw milk, water and products is below the reference value set forth by the Japanese government through regular testing and monitoring. We carry out testing on all bulk milk each time we receive it and ensure the radiation level is below the reference level. We ensure the radiation level in the water used in the plants is below the reference level by testing the water each production. We ensure the radiation level in partial products produced in plants is below the reference level by testing them by lot. We monitor the ratiological dosage by checking it at a fixed position in each production at the monitoring points(including production room). Note: Bulk milk, water and partial products are tested using a germanium semiconductor detector. Note: Monitoring points(including production room) are tested using a NaI scintillation survey meter. 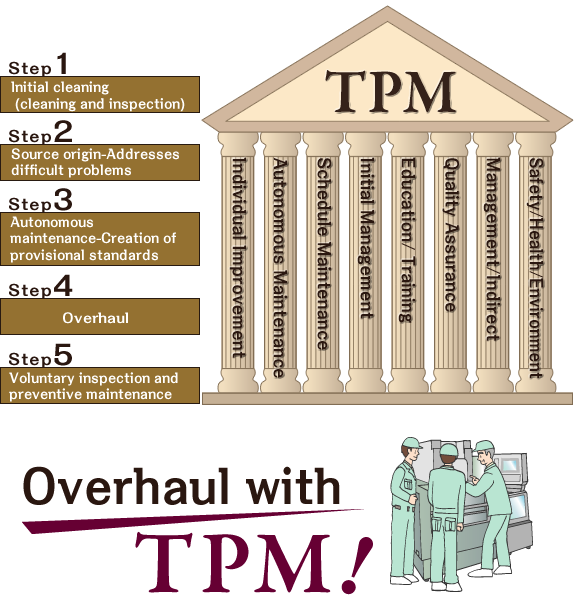 TPM is a system to build a company that aims for optimization of the production system. We are constructing a system that prevents any possible loss to achieve a disaster-free, defective-free and breakdown-free facility through a “go and see” philosophy. 5Ss—SEIRI (unclutter), SEITON (organize), SEIKETSU (immaculate), SEISOU (clean) and SHITSUKE (discipline)—is the mainstay of TPM and our production process is operated under this philosophy. TPM is comprised of eight steps. In this system, from the first step “initial cleaning” based on the 5Ss to the fifth step “voluntary inspection” and “preventive maintenance,” the company may go up and down the steps at times but eventually step up to the highest level in five to six years. At our company, all employees in the team participate in this activity. Organization of objects (arrangement and storage of objects with frequency of use in mind). Finishes up uncluttering and organizing while cleaning. Prevents pollution caused by oil, water, dust or gas that is generated during production and maintain a clean work environment. Carries out Steps 1 through 4 regularly to create awareness and make it a routine.